Ten years ago, in 2008, Laurence Hemming published his Worship as a Revelation. It has now lost its status as a 'new' book and will have a few decades to go before it becomes a Revived Classic. In this betweentime I thought I would remind you of this (uneven but) extremely important book. 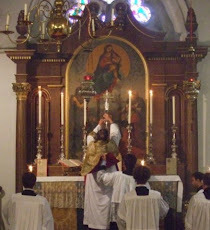 Not least of its importance is the fact that it reminds us of how close many of the instincts of the 'unreformed' Roman Rite - that is, the rite as it was before S Pius X got his hands on it - are to the ritual instincts which (apologies if as an ignorant Latin I have got this side of things wrong) animate Byzantine worship. And what you find here is an ever more intense application, as time goes on, of the associated principles of brevity (the clergy must not be given too great a burden to recite in their Office) and of avoiding repetition. An example of what I mean: before Pius X, you said psalms 148, 149, 150, every day at Lauds (all lumped together with one antiphon and just one final Gloria) . They were the 'Praise' psalms (ainoi) that gave 'Laudes' its name. But such incessant repetition means that there isn't room for a vastly extensive use of the rest of the Psalter ... unless you pile on the 'burden'. So under S Pius X they were removed from daily repetition, split up from each other, and, together with other psalms beginning Laudate, spread lightly around. That great Dr 'Patrimony' Wickham-Legg wrote: "In the estimation of the devout Roman Catholic, the Canon of the Mass and the distribution of the Psalter in the Breviary were almost on a footing as regards the impossibility of either being changed, amended, or re-arranged. They were the sacred Ark of the Liturgy, which no man might touch ... the Curia ... has already accomplished what can only be described as an astounding liturgical revolution, a thorough-going redistribution of the Psalter, in place of the old distribution, which can claim the most venerable antiquity; which Benedict XIV and his consultors in their proposed reform of the Breviary had not dared to touch, for they could not find that the Church of Rome had ever used any other"*. Liturgical scholars (at that time, many of them were still Men of the Tradition rather than innovatory tinkerers) were horrified at the disappearance under Pius X* from daily use of the ainoi, which at least arguably go back to the Jewish usage of the first century. The recent 'spreading more thinly' of Miserere, which used to mark each day in Lent, can also be deplored as a sad dilution of the spirit of that season. But ... if we were still to recite these splendid things ... and all the other splendid things ... preces and suffragia and goodness knows what ... and with recollection! ... our Office would take all day! Hemming cuts this Gordian Knot by arguing that not everybody always needs to say everything. *Those dodgy liturgists Quignon and Cranmer, followed by the equally dodgy 'Gallican' (Jansenist?) bishops who confected the eighteenth century French breviaries, had led the way in mistreating the laudate psalms. Incidentally, I won't get too dewy eyed about Wickham Legg's rhetoric because, I fear, his argument was that if Pius X could do such things, what harm was there in Cranmer having done them 350 years earlier? I did pray the pre-Pius X breviary for a few months and it does not take all day. Slightly more than two hours is the longest it ever took me. Though the time it takes to say is certainly more variable than those of breviaries of later reforms.